Get LETTERS FOR SCARLET for $0.99! 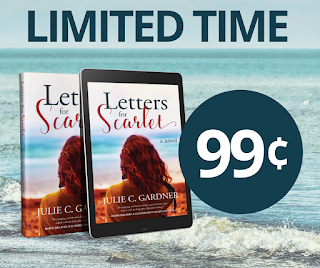 Letters for Scarlet by best-selling author Julie C. Gardner is on sale for only $0.99 through Sept. 29th! This offer is available in the U.S. and the U.K. If you've already read this compelling novel of friendship, secrets and love, consider recommending it to a friend. What would you do if you received a letter from your past self? Twenty-eight-year old Corie Harper embarks on an emotional journey after receiving a graduation letter she forgot she wrote. Although she spent a decade hiding her secrets, each page reminds her of the friendship she lost with her best friend, Scarlet, when her now-husband, Tucker, got between them. Scarlet, who hasn’t seen Corie since, blazed her own path and left the past far behind. Or so she thinks. Pregnant with a baby she’s scared to have, Scarlet must decide if she wants to continue alone or find the courage to mend her broken friendship. Can these former best friends overcome the betrayal that changed their lives?